Multi-photos Post #5 was published 10 days ago and the upcoming post #6 and #7 are soon to deliver. I shall be brief on this blog post, for I’m running out of time. 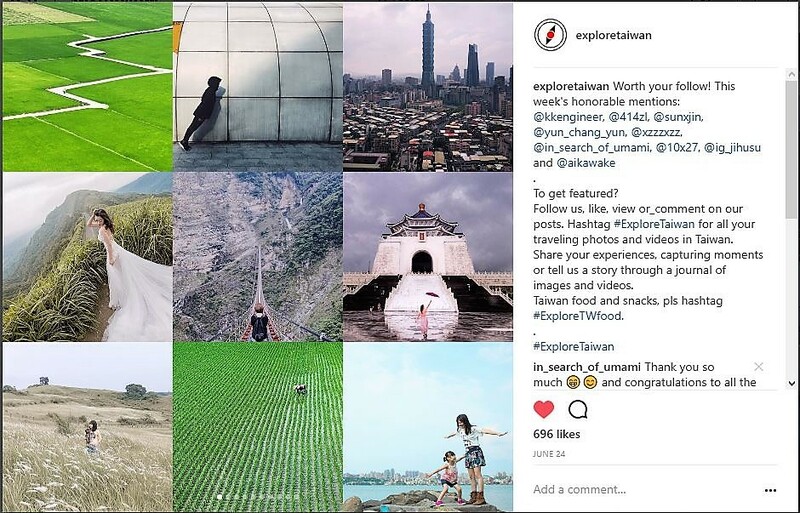 These are the 9 images selected for featuring on Explore Taiwan Community. Rice field has been trending since the past few years. Waipu Wangyu Valley, rice field is a river plain sourced by Dajia River that runs through Taichung City, the central region of Taiwan. These are the popular ones for rice field trips. Generally there are described as Golden Rice Field (黃金稻浪) by the local. Taipei Songshan Airport, Raohe Street Night Market and a MRT train station called Songshan Station. Taipei 101 was the tallest building from 2004 to 2008 in the world, dwarfing the surrounding low-rise and shop houses. Now, this building has new ‘friends’ and no longer a Lonely Giant of the Taipei Skyline. A short distant from Jiufen Old town. Scooter is the prefered transportation. Once or twice, I noticed grammers posting photos with cars parking at the side of the straight road. That’s not a very pleasant sight for photography. A short hike including a flight of stairs. There are two waterfalls with steep cliff. Shuiyan Suspension bridge is 337 m in total length. In front of Chiang Kai-shek Memorial Hall is the Liberty Square. A large area for public gathering. Directly opposite at the far end is the tall Chinese architectural arch named Liberty Square Gate. Similar struture for temple’s ceremonial arch but with more dragons, pheonics, kirins and deities. Liberty Square is flanked by National Concert Hall and the National Theater. Both grand buildings are located just a stone’s throw away. Located in the suburban district of Tainan City. About 15 km from Tainan Station. Location is considered less developed with no tall buildings but plenty of plantations and grasslands for farmers. Wouldn’t recommend unless you have the availability of time and a scooter. No public transport available. Please refer to #1 of this post for recommended 8 locations. A short ferry ride from Tamshui River Old Street. All the photos are briefly described and not meant to be detailed. Casual writing prose and information are in bite-sized. It aims to give readers a quick idea of the names, locations, its background, travel tips, suggestions, alternative places and the Chinese name for easy references.